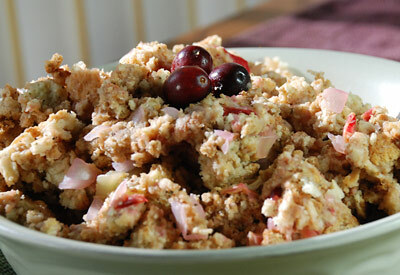 This vegetarian dish brightens up the table with flecks of pink and red cranberries scattered throughout the stuffing. In a saucepan, combine broth, pepper, celery, cranberries and onion. Bring to a boil. Cover and cook over medium heat for 5 minutes or until vegetables are tender. Add stuffing mix and stir lightly. Let stand 5 minutes before serving.